The attitude of the first Mohammedan rulers toward their Jewish subjects was as much regulated by circumstances as had been that of Mohammed himself. The latter, having subdued the Jewish tribes of Arabia and located them in the northern borders of the peninsula, permitted them to remain on condition that they gave half their harvest to the Moslem authorities. This was a policy of utility pure and simple, as the Jewish farmers were needed to help feed the Moslem armies. The same policy was upheld during the reign of Abu Bekr, and his successor Omar was guided by two principles, viz., to preserve the mobility of his army by not allowing them to turn agriculturists, and to banish all non-conformists from Arabia proper. This course of action resulted in the tolerance of non-Moslem settlers in the adjoining provinces, while imposts and land-taxes laid upon them secured the revenues of these conquered territories for the benefit of the commonwealth. Omar wrought another and more important change in the fortunes of his Jewish subjects. He transplanted them to Kufa, a town he had founded in the year 15 of the Hegira, in 'Iraḳ, the ancient Babylon. Apart from the imposts laid upon them, they were obliged to wear a special garb to distinguish them from the Faithful, and were further bound to grant three days' hospitality to every traveling Moslem, to permit the latter to enter their places of worship, and to abstain from riding on horseback and from using expressions derogatory to Islam. A Moslem legend relates (Tabari, p. 2403) that at the conquest of Jerusalem Omar was greeted by a Jew as the friend of Elijah. This legend conveys theidea that the Jews of Palestine considered the Moslem victory a relief from the persecutions to which they had been exposed under the Byzantine régime. The Jews of Ḥoms also looked forward to the conquest of their city by the Moslems (Beladhori, ed. De Goeje, p. 137). During the siege of Cæsarea a Jew named Josef is said to have led the Arab warriors through a subterranean passage into the town which contained 100,000 of his coreligionists. According to another legend, the convert Ka'ab al-Aḥbar predicted Omar's death three days before the latter was assassinated (Ibn al-Athir, iii. 38; concerning Abdallah ibn Saba see i. 43). 2. Ommiads: Ommiads and Fatimites. The government of the califs of the house of Omayya was guided by principles unlike those of their predecessors. Religious interests gave way to dynastic considerations. Civil war and party strife increased. The unity of the Moslem religion was broken by deep schisms. The Jews profited by these conditions in that the heads of the various political and religious factions had no leisure in which to disturb them. They not only became reconciled to the new order of things, but took part in the spiritual life of the Moslems and in the rise of literary activity among them. The physician Maserjaweih of Bassora translated (683) a medical work from Syriac into Arabic (Steinschneider, "Z. D. M. G." lii. 428 et seq.). In Irak the Jew Somair struck coins for the calif 'Abd al-Malik, but was put into prison and threatened with death by the tyrannical governor Hajjaj. See Jewish Encyclopedia, i. 39. With the conquest of Egypt many Jewish communities came under the Mohammedan rule. Amr b. al-Asi, the conqueror of the country, is said to have reported to Omar that he found in Alexandria alone 40,000 Jewish taxpayers (Calcashandi, tr. by Wüstenfeld, p. 44). Otherwise the Jews of Egypt, and of Africa in general, were not much in evidence for about two centuries. They seem to have enjoyed comparative peace under the various dynasties which strove to detach the North-African provinces from the commander of the Faithful. Ziadat Allah, the last Aghlabide prince, appointed the well-known Isaac Israeli (the Elder) his physician-in-ordinary. When the Aghlabide rule was overthrown, Isaac passed over into the service of the conqueror, Obaid Allah, founder of the Fatimite dynasty. This was about the time that Saadia was born in Fayum. Obaid Allah himself was said to have been the son of a Jewish widow in Salamiyya. His name was Said, and when his mother married the Shiitic chief Al-Ḥusain, his stepfather converted him to Islam. He was then declared to be the long-expected Imam, and, on coming to power, he assumed the name "Obaid Allah." This story is, however, supposed to have been concocted in order to discredit the descent of Obaid Allah from Fatima, the daughter of Mohammed. Obaid Allah and his successors extended the Fatimite power at the expense of the califs of Bagdad. Al-'Aziz, who had made himself master of Syria, appointed the Jew Manasse and the Christian Isa his lieutenants (996). Through the treachery of several Moslem citizens they were, however, subsequently deposed and thrown into prison. 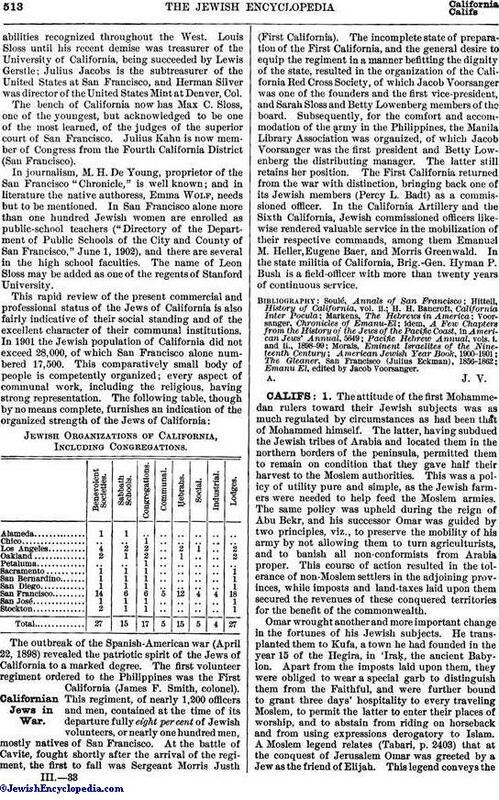 This change of policy toward the Jews assumed a much graver character under the next calif, the famous Al-Ḥakim. This monarch, suddenly seized by a fanatic zeal for his cause, developed what is called the "religion of the Druses" (see De Sacy, "La Religion des Druses," p. 303). One of the consequences of his doctrine was excessive severity in the treatment of non-Moslems. In 1004 he ordered Jews and Christians to wear black turbans, and black marks on their yellow costumes, and when bathing they were obliged to wear around the neck a bell, or a block of wood weighing five pounds and resembling a calf's head. Jewish bathers were distinguished by wooden blocks. Jews were forbidden to ride on horseback, or to hire mules and asses from Moslem owners. They could use only wooden saddles, and were compelled to wear the bags on the right side. Moslems were forbidden to serve them or to allow them the use of their ships. Spies were employed to discover all transgressors of these restrictions. Many Jews adopted Islam, or pretended to do so, and many emigrated to foreign countries. Shortly before his death Al-Ḥakim relented, and permitted the Jews to return to their old faith. About this time the brothers Abu Sa'd Ibrahim and Abu Naṣr Harun, sons of Abu Sahl of Tustar, were prominent merchants in Cairo. The calif AlẒahir (1021-36) bought from Abu Sa'd a female slave, who became the mother of the next calif, Al-Mustanṣir. In consequence of this, Abu Sa'd's influence became very great. At his recommendation Al-Mustanṣir appointed Abu ul-Fatḥ Ṣadaḳah, a converted Jew, as vizier. Some time afterward the latter caused Abu Sa'd to be assassinated. Under the rule of Al-Amir (1101-30) a Jew named Abu al-Manja was appointed governor of the district of Damietta. At the request of the citizens he built a canal, which was long known under the name of "the canal of Abu al-Manja" (Makrizi, i. 487; Calcashandi, p. 27). The next calif, Al-Ḥatiẓ, appointed the Jew Abu Manṣur his physician-in-ordinary; the latter, when commanded to poison the calif's son, refused to do so. In 1171 the Fatimite califate was declared extinct by Saladin. 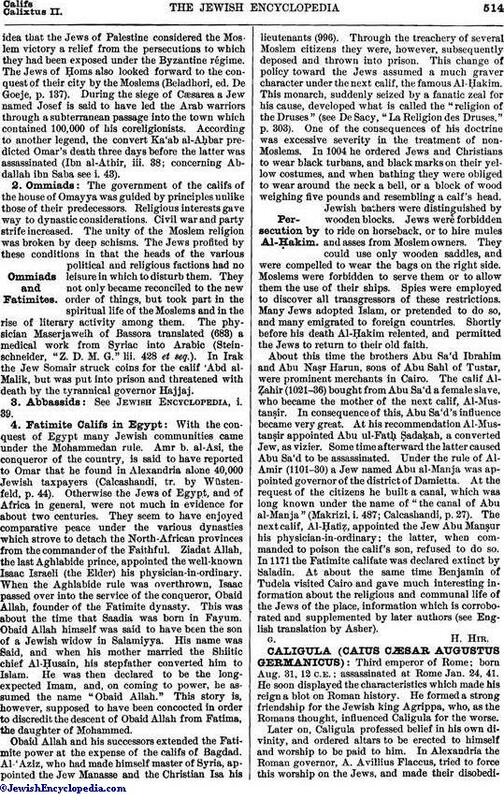 At about the same time Benjamin of Tudela visited Cairo and gave much interesting information about the religious and communal life of the Jews of the place, information which is corroborated and supplemented by later authors (see English translation by Asher).